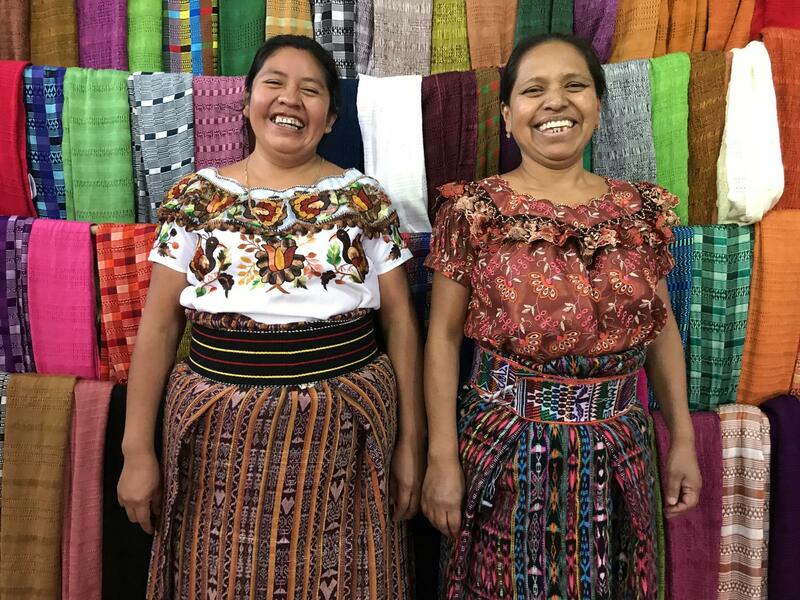 Micaela and Elena are members of Ixoq Ajkeem –Tz’utujil for “woman who makes cloth” – an all-female cooperative located in San Juan la Laguna, one of 11 towns on Lake Atitlán. 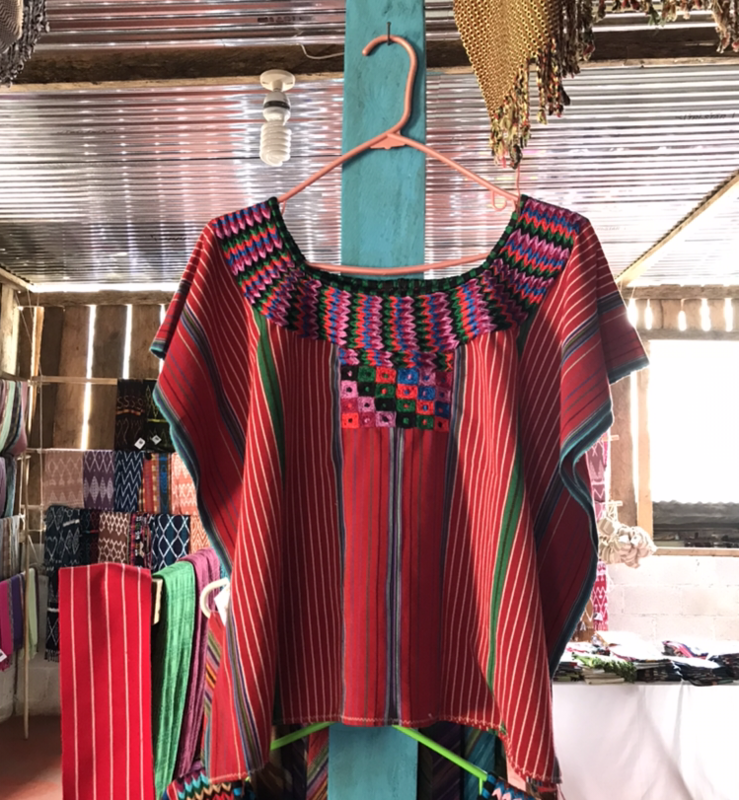 They are also Kiva borrowers by way of the organization’s Field Partner, Friendship Bridge.Their trade is typical of Mayan women all over the western highlands of the country: they make the colorful clothes that indigenous Guatemalans have been wearing for hundreds of years. Micaela spinning thread from cotton. In the early 90’s, towards the end of a 36-year civil war, tourism began to trickle into Guatemala. The new foreign visitors took note of the beautiful traditional patterns that the indigenous people would wear day-to-day. Seeing an opportunity, Elena and 4 other women decided to start a cooperative: with a microloan, they joined together to bring their trade to the tourists. The women of San Juan la Laguna have been perfecting their craft for centuries. Traditionally, the men would work in the plantain fields, while the women would make the clothes. 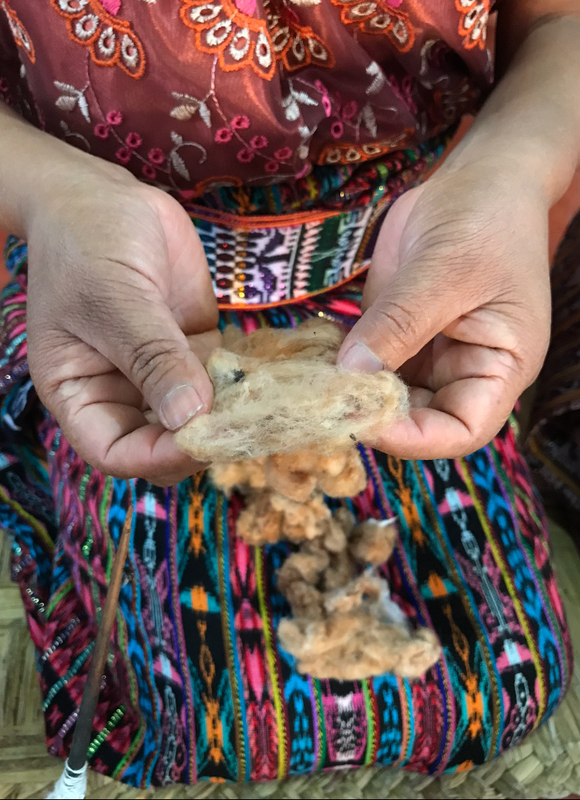 It’s an involved process: first, the cotton must be harvested; second, it is spun into thread; third, the thread is dyed with natural plants and minerals; fourth, the thread is woven into a prescribed pattern; and finally, the garment is stitched together into a huipil – a traditional shirt – or a corte – a corresponding skirt, or any other type of accessory, including headpieces, scarves, bags and jackets. A row of scarves for sale at Ixoq Ajkeem. These days, the means of production are compartmentalized. That is, a group of women in one village spin and dye the thread, and sell it to another; that group weaves it into cloth, which they sell to another, and so on. The vast majority of Kiva borrowers in Guatemala form some part of the process. At Ixoq Ajkeem, the women create the garments from start to finish, and their process is free for tourists to watch. Elena, along with her colleague Martina (another founding member of the cooperative), sits down with me to discuss their story. As a child, Elena was able to acquire 4 years of education, and Martina 3, and they can barely read or write. They could also not speak Spanish until a Friendship Bridge program stepped in to teach them. I ask them what it’s like to finally learn the official language of their country. Like nearly all women in San Juan – particularly of their generation – Elena and Martina learned their craft from their mothers, who have in turn been learning it from their mothers since long before the Spanish arrived 500 years ago. 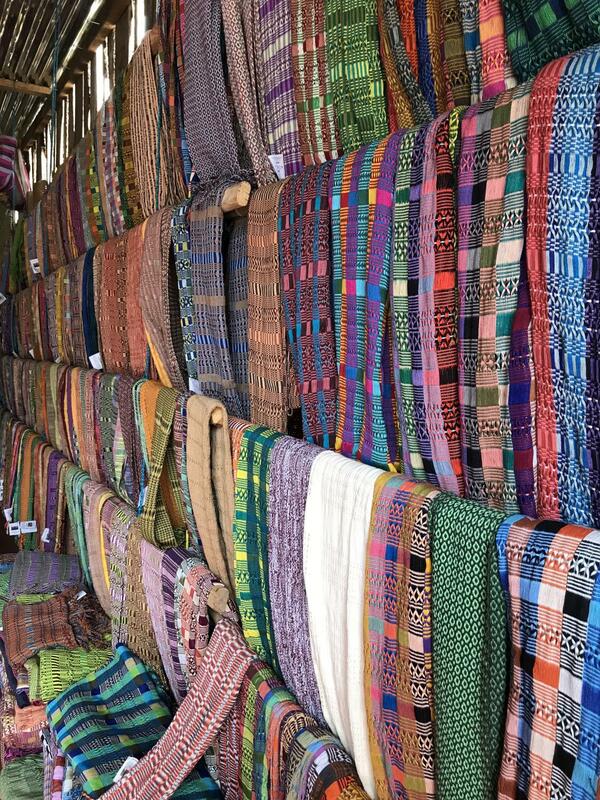 Perhaps due to the matrilineal nature of the craft, each town has developed their distinct designs on their clothes. In San Juan, this design includes a red huipil with 24 little squares, and a neckline with a series of squiggly lines—with each line squiggling exactly six times. These numbers represent the 24th of June, the patronal day of San Juan himself. The traditional huipil of San Juan la Laguna. Fifty years ago, a resident of San Juan or any of the other towns on Lake Atitlán could recognize which town a person came from based on his or her clothing. Nowadays, the designs have gotten a lot more mixed together, as modernized transportation has made the fabrics from larger urban centers easier to come by. Ixoq Ajkeem now has 15 members, and a 2-story shop where they sell their products. Eighty-five percent of the earnings go to each woman, and 15 percent goes into the maintenance of their facility. Both Elena and Martina have also enjoyed the sense of sisterhood the cooperative has afforded them. 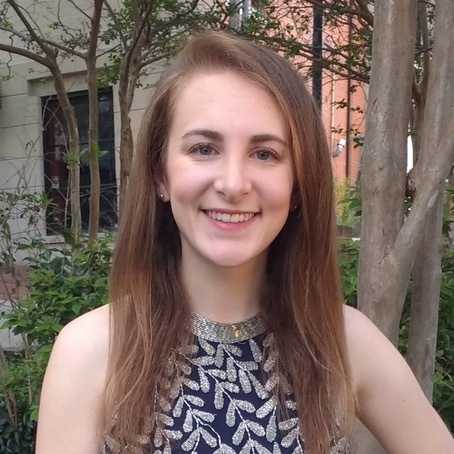 “There’s no gossiping, and we’re always able to give each other advice,” Elena tells me. Elena has 4 children between the ages of 8 and 20. The oldest – a girl – is in university, studying law. The younger ones are also in school, and Elena hopes that they continue studying so that they can have opportunities that were never available to her. All of the dyes used are natural and plant (or insect!)-based. Thanks to Friendship Bridge’s support, the women of Ixoq Ajkeem have been able to expand their operation and sell to customers from all over the world. Elena and Martina enjoy the international presence in their town, which they credit for inspiring the municipality to invest in street art and clean up trash; in fact, San Juan la Laguna is taking steps to follow their neighbor San Pedro’s lead in banning single-use plastic bags and straws. 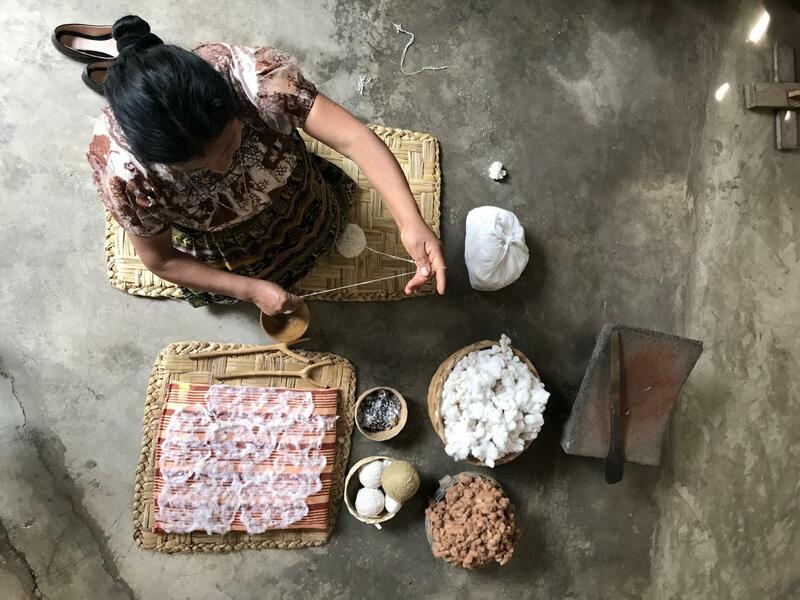 Between the plastic ban and cooperatives like Ixoq Ajkeem that allow Mayan women to make a just profit off of their trade, San Juan offers an excellent example of sustainable tourism. Ixoq Ajkeem is located in Canton Central, San Juan la Laguna, Solola, Guatemala.